Michael Brosseau has emerged as a legitimate infield prospect in the Rays' system. PORT CHARLOTTE - Everyone's path to the upper levels of the minor leagues is different, and there's no doubt that Michael Brosseau's is just that. 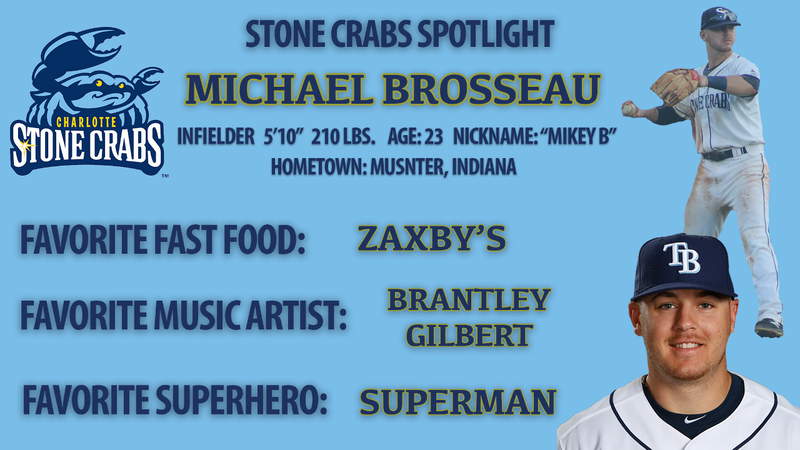 Debuting with the Stone Crabs late in 2017, Brosseau has overcome the odds by hitting his way through two levels and completely skipping two others in less than two years. That feat is even more staggering when you consider that all 30 teams passed on him during the entire 2016 MLB Draft. After a heralded four-year career at Oakland University in Michigan in which he set the school record in assists and finished fifth all-time in hits, the senior went undrafted. "I was expecting to go in the draft," Brosseau said. "I think I did what I had to do to get myself on those draft boards. But it just didn't happen. Sometimes life happens like that." But a late phone call on June 11, the final day of the draft, gave Brosseau a chance. It was from James Bonnici, the Rays area scout for Michigan. "He basically just laid it on the table," Brosseau recalled. "He said 'We have a roster spot for you. I can't promise you much, but there's a spot for you and you can do what you want with it.'" Brosseau ran with it. He hit from day one, batting .319 with 13 extra-base hits in 35 games with the GCL Rays that summer, earning league all-star honors. "This opportunity comes around once in a lifetime so I knew I had to give it my all and do everything I can to put myself in a good situation with this organization," he said. The following season in 2017, Brosseau played well in spring training, earning a spot with the organization's full-season Single-A affiliate in Bowling Green. A shortstop in college, the Rays made a point to teach Brosseau all of the positions on the infield, allowing him to serve as a useful utility player for the Hot Rods. "I played first base for the first time last year," Brosseau said. "Down in Bowling Green, I had great coaches that got me the work I needed both in pre-game and on off-days. All of those reps helped me out in game situations." While learning new skills on defense, Brosseau put his old tricks to work at the plate, dominating the Midwest League. He hit .318 over 80 games, smacking 29 extra-base hits and reaching base at a .393 rate. The Rays had no choice but to promote him to the Stone Crabs, which they did on August 7. "Maybe he will be along the lines of Kirby Yates or Elliott Johnson, a non-drafted free agent who got to the Big Leagues," Rays farm director Mitch Lukevics said. "He's an infielder by trade but his forte is to hit." Brosseau's reputation off the field is also pristine. He's emerged as a leader in the clubhouse and carried a mature, professional profile everywhere he's gone. "There's no finer teammate in the Tampa Bay Rays organization than Mike Brosseau," Lukevics said. "He's a wonderful hitter. He's a fabulous teammate. Maybe it's Michael Brosseau's time." It's likely that Brosseau begins the 2018 season with the Stone Crabs. If he does, there's no doubt his leadership amongst a group of young and talented position players will go a long way.